One of the complaints I hear most often from clients is that they wish they had more energy. I get it. If I don’t get enough sleep, am under stress, say yes to too many obligations, or am not eating well, I turn into a cranky, french-fry craving zombie. It's not my best look. Trying to do it all and fit our busy lives into 24 short hours can be overwhelming if we don’t have the energy that is demanded of us. So we rely on coffee and energy drinks, afternoon sweets, or even medications to help us wake up, and then again to sleep, so that we can still do EVERYTHING. This is really no way to live. Ignoring the problem and relying on quick fix-its to power through can lead to more serious health conditions. There is a better way, I promise. While there are a variety of reasons and health issues underlying why we may experience low energy, there are some simple things we can all do to address the foundations of energy. Clearly, getting adequate sleep is essential, as is exercise, stress management and simply just learning to say no. These are all very important issues, and could each easily make up their own blog topic. For the sake of brevity, this post will focus on the nutritional requirements and advice for giving your body what it needs (and eliminating what it doesn’t) to run optimally and provide us with the energy we want to live life to the fullest! When we talk about energy and nutrition, its helpful to have a little background info. We obtain energy from the food we eat, mainly carbohydrates, which we use as glucose for ATP, but our bodies can also use protein and fat for energy. Our hormones are responsible for regulating our blood sugar, through an intricate system that moves glucose from the food we eat out of the blood system and into the tissues. This is done mainly by insulin, a hormone produced in the pancreas. When we eat, our blood sugar increases and insulin is released to move the glucose into the liver, muscles and fat tissues for storage. High spikes of insulin will lead to dramatic drops in glucose (hypoglycemia), which leave you feeling tired and sluggish. Think of how you feel after eating something sugary, like birthday cake. Initially you may feel pretty great, but an hour or so later your energy drops, you feel cranky, or may even get a headache. Your liver, initiated by specific hormones, can then generate and release glucose which will raise the blood sugar level. This system is constantly working to keep blood sugar fairly even. Our diet and lifestyle can either help it along, or make it work harder. For instance, the standard American diet, full of refined flours, sugar and low in vegetables and fiber, can contribute to insulin resistance, wherein the cells stop responding to insulin, blood sugar remains high (hyperglycemia), and the body then releases even more insulin in response. Stress also raises our blood sugar with cortisol, another reason managing stress is so essential for weight and health. If you feel like you're constantly tired or swing between extreme highs and lows, keeping your blood sugar balanced is essential. It will help to keep your energy balanced throughout the day, avoiding that all too common 3 o’clock slump, or feeling tired but wired at night when you are finally ready to rest. Here are my tips on how to eat to gain more energy. It's not a comprehensive list, but its a fantastic start to addressing basic nutritional issues that could be zapping away your energy. For more guidance, personalized analysis, and targeted nutrients and supplements, I highly recommend working one on one with a nutrition consultant for the support you need. 1. Remove any foods that are harming you. This starts with eliminating the obvious culprits: processed foods, refined carbohydrates, sugar & white flour. These foods literally drain your body of energy, using up nutrients to be digested, but providing you none in return. Sure you’ll get an immediate boost from the sugar, but the long term effects lead to a crash in energy, imbalances in your body’s blood sugar regulation systems, and a dependency on sugar to feel awake. No good. It is also essential to remove any foods that you are sensitive or allergic too. Anything you are allergic or intolerant to triggers your immune system, causes inflammation, and drains your energy. It can also cause a number of seemingly unrelated symptoms such as eczema, headaches, or digestive disorders. Sometimes it can be a food we think of as healthy, but it triggers a reaction in your body. Discovering these foods can be a little tricky, even if you’ve had a IGE allergy test, there can still be more subtle intolerances that the test doesn’t catch. The first two to foods to eliminate are gluten and dairy. Try taking them out of your diet for 3-4 weeks and see how you feel. This is something I work carefully with clients to do, as its a process that takes some detective work. Discovering foods that may be inflammatory to your body with a supervised elimination diet, along with healing any digestive system damage, is key. 2. Eliminate caffeine and alcohol. I know, I know. Don’t hate me - it's just temporary! If you are dependent on caffeine to wake you up, it may be time to hit the reset button. Is coffee inherently evil? Of course not. I love coffee and drank a cup a day for about 20 years. There are even studies that demonstrate that people who drink a moderate amount of coffee live longer than those that don’t. But if you’re depending on it to wake you up every day, you’ll never be able to regulate your energy naturally. Caffeine increases cortisol, which increases your blood sugar. As for alcohol, it can disrupt your sleep cycle and appetite. How often do you wake up after a night of drinking, tired and craving greasy food? Additionally, alcohol is sugar, carrying with it all the problems discussed above. You don’t have to go cold turkey, and it doesn’t have to be forever. I recommend cutting the amount of caffeine and alcohol in half for a week or two. You can drink decaf coffee, or substitute coffee with green tea, which has less caffeine, and lots of antioxidants and health benefits. Then, try going caffeine and alcohol free for two weeks. Initially you may feel tired, but if you stick with it, it will help your body reset its natural cycles. If you continue to drink either one, have them with food and never on an empty stomach. 3. Increase your nutrient density. Focus on a variety of vegetables & fruit, nuts & seeds, herbs & spices to get the phytonutrients, vitamins and minerals your body needs. Plant foods provide fiber, which is incredibly important for detoxification, as well as slowing down carbohydrate metabolism and keeping you off of the blood sugar roller coaster. Support the liver with cruciferous veggies, such as cabbage and Brussels sprouts, as well as bitter greens like dandelion and watercress. Leafy greens, nuts and seeds are high in magnesium, associated with improved metabolism and glucose tolerance. Berries are low in sugar and high in antioxidants to protect your cells. Starchy veggies like potatoes, corn and peas have their place, but for the purpose of regulating blood sugar, best to eat those in moderation. Cinnamon helps to improve your insulin sensitivity, add it to smoothies and sauces often. 4. Eat 3 meals a day. This helps to regulate your blood sugar levels, normalizing insulin and cortisol and avoiding any extreme spikes and crashes that go along with skipping meals. Hanger (Hunger + anger) is real. It’s also important to eat enough, but not too much. Over stuffing yourself with larger meals means higher blood sugar, more insulin, and can exhaust your regulation system. Don't worry too much about counting calories, just try not to let yourself become too starving, or too full. If you tend to have a fast metabolism, exercise excessively, or have low blood sugar, then include two snacks a day as well. 5. Include protein and fat with every meal and snack. Protein promotes satiation, leaving you feeling full and satisfied, helping to avoid sugar cravings. Fat will help to slow carbohydrate metabolism. For instance, a slice of bread with almond butter will increase blood sugar less and take longer to process than a slice of bread alone. Fat should come first from whole food sources, such as avocados, nuts and seeds. A limited amount from oils like olive oil and coconut oil, but all refined vegetable oils should be avoided. Pasture-raised, organic eggs and sustainably caught cold-water fish are options if you eat animal products. The exact of amount of calories and macronutrient ratios depends on factors such as weight, age, and activity level, and can be best determined with the support of a qualified health practitioner. Try to drink half your body weight in oz. of water daily. Not all at once, the key here is have about a cup of water every hour or so. If it makes you feel full, drink it away from meals. Add an extra cup for every serving of caffeine or alcohol. 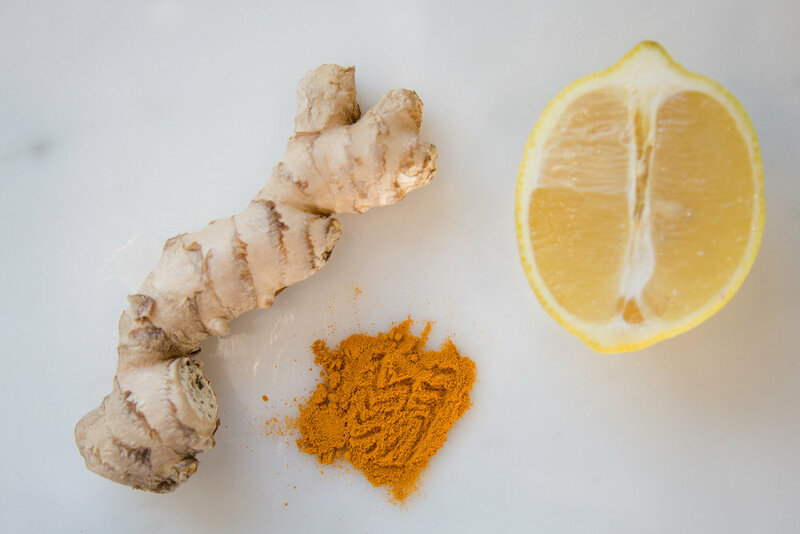 Add lemon for extra liver support and hydration. Our bodies need water. Even mild dehydration can affect our mood, performance and energy levels. Often we confuse hunger with thirst, leading to overconsumption of food. This is really the easiest (and cheapest) thing you can do yourself every day. At least three different colored veggies. A whole grain like brown rice or quinoa, or a gluten free noodle like buckwheat soba. Clean protein, like egg, tofu, or bean. Healthy fat, like avocado, almonds or pumpkin seeds. Sea vegetable, like wakame or dried seaweed seasoning. Include a sauce, like tahini, miso-ginger, or peanut. Energy can be a tricky thing, and its affected by so many factors, not just food. It will naturally change from day to day, season to season. Start to pay attention to things in your life that give, or take your energy. Keeping a food journal along with noting your energy level each day can be helpful in tracking your food sensitivities and noticing patterns. If you're looking for help figuring this all out, let's talk! I hope you find this information helpful, and motivates you to begin taking care of yourself. I love hearing from you, so feel free to reach out with comments or questions, and let me know how these tips work for you! Tell me if you can relate: You’re serious about being healthy, you’ve gotten rid of the processed food and stocked the fridge full of fresh produce, and you’ve just made a super nutritious meal for your family to enjoy together. Unfortunately, no one else is impressed. Your kids don’t want to eat veggies, your husband doesn’t want to try anything new, or maybe whomever you’re sharing a meal with just has really different tastes than you. I've been there. When I first started dating my husband, we would often make dinner together. We both liked to cook, the problem was we had totally different ideas of what “good” food was. I was used to making simple, fresh meals. Admittedly, my cooking might have been a little bland, but at least it was healthy. He liked to make really decadent meals, usually full of cheese, breading and butter. Delicious and impressive, but not healthy. It took some work, and lots of conversations about food, but over time we have both adjusted our styles a bit – I make meals that are a little more hearty and flavorful, and he’s gotten pretty creative with vegetables and healthier ingredients. I often talk about this issue with clients who are working hard to improve their health, but face opposition from their family or significant others who aren’t quite ready or willing to embrace change. It’s hard enough to stay on track without the added stress of fighting over what's for dinner or having to make separate meals for everyone, right? Right. Well, I'm here to help. I promise, there IS a happy medium somewhere. I’ve put together some super helpful ways for you to have your veggies, and eat them too! This isn't about trying to convince others to eat like you, resisting peer pressure, or what to order when you're eating out (all important topics, but I'm trying to stay focused here), it's about finding a way for you to make and enjoy nourishing food, without alienating yourself at your own dinner table. You can still stick to your healthy diet and keep the peace at dinnertime. 1. Make customizable meals. Everyone loves to top their own pizza and make their own tacos. The key is to provide a variety of options so there’s something for everyone. For pizzas, try adding pineapple, olives, mushrooms, spinach, fresh tomatoes and bell peppers to the menu. For your taco bar, include fillings like black beans, roasted cauliflower, sautéed onions with bell peppers and even an alternative taco “meat” from tofu or tempeh. Toppings like tomatoes, shredded cabbage, cilantro and avocado are more nutritious additions to the usual cheese and sour cream. 2. Make satisfying meals with protein and healthy fats to increase the “hearty” factor. Even though a salad can fill you up, lots of people have it stuck in their head that healthy food just isn’t filling. Prove them wrong by including protein like beans and whole grains, tofu, or pastured eggs, and healthy fats like avocado, olives or olive oil, nuts and seeds for a satisfying and hearty meal that is still really good for you. 3. Swap traditional ingredients for healthier alternatives. You can still make your classic stand-by meals that everyone loves, but upgrade some of the ingredients for a healthier version. For example, swap burgers for portobello mushrooms, zoodles (spiralized zucchini) for pasta noodles, and brown rice or quinoa for white rice. They might even like these new versions better! 4. Don’t skimp on flavor – Many people don’t like vegetables because they haven’t been cooked properly or are bland, thrown on the plate as an after thought instead of getting the attention these disease fighting, nutrient dense plants deserve. Adding lots of dried or fresh herbs, spices, garlic, ginger and simple sauces like the pesto recipe below can transform boring veggies into tasty treats. Experiment with different cooking methods such as steaming, sautéing or roasting, to see which your family likes best. 5. Give over some control – Allow your dinner dates to pick one ingredient or aspect of the meal. For example, if you tell your kids they have to eat a vegetable, then they get to pick which one it is. Or maybe your dinner date wants steak, but you serve it as a steak salad. It’s about finding a compromise that allows you to stay on track with your healthy eating while letting others still have a say in the food they’re eating too. When people feel included in the process, they are more likely to enjoy the outcome. As mentioned above, here's a delicious and easy to make zoodle recipe. Some whole wheat pasta once in awhile isn't necessarily unhealthy, but swapping for zucchini provides more water, fiber, and nutrients, without the refined flour and gluten of wheat noodles. This will leave you feeling satisfied, without the heaviness of blood sugar spike of traditional pasta. And zucchini are still in season for about another month! Additional options: Fresh or sun dried tomatoes, toasted pine nuts, chopped greek olives, sauteed greens like chard or broccolini. Blend all pesto ingredients together in a food processor or blender. If you have a spiralizer, use for the zucchini noodles. If not, you can use a vegetable peeler, just discard the center core with the seeds. You can lightly sautee the zoodles for just a few minutes in a bit of olive oil and pinch of salt, but they are good raw too! Top with the pesto and any other desired toppings. Enjoy! Try these suggestions out, and let me know how it goes! Or if you've found any other methods that have helped, I'd love to hear your experience. I hope this helps you to have a happier, healthier meal time with loved ones. I think we can all agree that eating well is important to our health. Extremely important. But sometimes just as important as what you eat, is how you eat. Most of us don't put a lot of thought into it, we just get the food in our body and move on. However a lot of digestive complaints, and subsequent health issues, stem from improper digestion caused by the way we eat. Our bodies do a lot of work when we consume food. They release hormones, secrete enzymes, move muscles, and communicate to other cells to digest the food, assimilate nutrients, and store energy from our meal. All of this happens without any conscious participation from us. This happens thanks to the Autonomic Nervous System (ANS). The ANS has three branches, enteric, sympathetic, and parasympathetic. We won't get into the enteric nervous system now, but its also really important for digestion. Our sympathetic nervous system is responsible for our “fight or flight” response. The sympathetic nervous system is responsible for reacting to real or perceived stress. That’s right: whether you’re running from a cheetah, or getting yelled at by your boss, your body has many of the same responses. Mainly, your blood gets pumped to your extremities (and away from organs like your stomach) in case you need the extra energy to run. It also releases cortisol and excitatory hormones and neurotransmitters. The take away message for today is: it slows down any processes not necessary for immediate survival, in other words, digestion. The parasympathetic nervous system is also known as “feed and breed”. It handles those other activities we need to survive in the long term, once that cheetah has gone away. This is the state we want when we are eating and digesting. So how do we attain this? Doesn’t our body just do it naturally? Not necessarily. Our body is constantly taking in information from our environment that will dictate how it reacts. Without getting too much into the physiology of it all, we basically have to create an environment where the body can relax and fully focus on the task at hand, in this case, eating and digesting. Because if we’re running from a cheetah, our body isn’t worried about digesting that meal you just ate. Remember how I said our bodies respond the same to real or perceived stress? Well, guess what. If you’re feeling stressed or upset about something while you eat, your body won’t be focused on digesting your meal either. So when eating right after an argument, while worrying about your loved ones, or even feeling sad or mad about the state of the world, you won’t be optimally digesting your food either. So, why does all this matter? Just about every client I work with at some point or another complains of some digestive issues, like bloating, gas, constipation, or stomach pains. Certainly food sensitivities, imbalanced gut bacteria, and a variety of other things can cause these symptoms. But how you are eating should be first on the checklist when trying to improve your digestion. It's the easiest to change really, and doesn't even involve a trip to the grocery store or a fancy supplement. Mindful eating is the solution. It is simply a way of being aware not only of what, but of how you’re eating. Here are some techniques you can try to set yourself up for optimum digestion and assimilation of your food and nutrients. 1. Chew Your Food – Seems so obvious, right? In reality, most people don’t chew their food enough. Chewing mixes the food with digestive enzymes in the saliva and activates the parasympathetic nervous system. Different types of food require different amounts of chewing of course, but try to chew until the food is all soft and blended, no small bits left. You can start by counting your normal amount of chews on the first bite, and then add 5 more on the next, and so on until your food is liquid before swallowing. 2. Pay Attention – So many of us eat distractedly. We eat at the computer, watching TV, while driving texting or doing 17 other things at the same time. While this might seem efficient in terms of saving time, it is totally inefficient for your digestion. When your brain is focused on other things, it can’t fully focus on all of the actions necessary for digestion. The result? Undigested food that can cause bloating, gas, and decrease nutrient absorption. Instead, try to pay attention to your meal. Enjoy the smell of your food, savor the flavors, notice the colors and textures. 3. Be Grateful, Calm and Present - Avoid eating when feeling upset or stressed out. I often suggest to clients to take 3 deep breaths when they first sit down for a meal. Deep breathing helps to calm down the nervous system and relax us. Whether you say grace before or a meal or not, taking a moment to be thankful for even having food in the first place, can help bring yourself into the present moment and allow other worries to fall away. Try to let go of anything nagging you from the past or concerns about the future, and focus on the present moment while you enjoy your meal. 4. Eat Slowly – This is key not only for optimum digestion, but for weight loss as well. It takes 20 minutes for the body to register it is full. The fast food revolution has done as no favors, and certainly normalizing quick meals is one of its drawbacks. Food is meant to be enjoyed and appreciated. If you’re a fast eater, try putting your fork down every 3 bites. If you’re with other people, take time to converse during your meal, taking breaks between bites. Once you start chewing your food more and eating without distraction, meals naturally take longer. But if you’re curious, eat your next meal in typical fashion and time it. Then, try to make the meal after that last 5 minutes longer. 5. Stop Before You’re Full – In Okinawa, Japan, one of the world’s Blue Zones, where its citizens live longer than most, many people practice Hara Hachi Bu. This ancient teaching says to eat until you are 80% full. When you eat slowly enough to notice signs of fullness before you’ve overdone it, not only will you feel better and avoid that uncomfortably full feeling, but you’ll avoid overeating and weight gain from oversized portions. 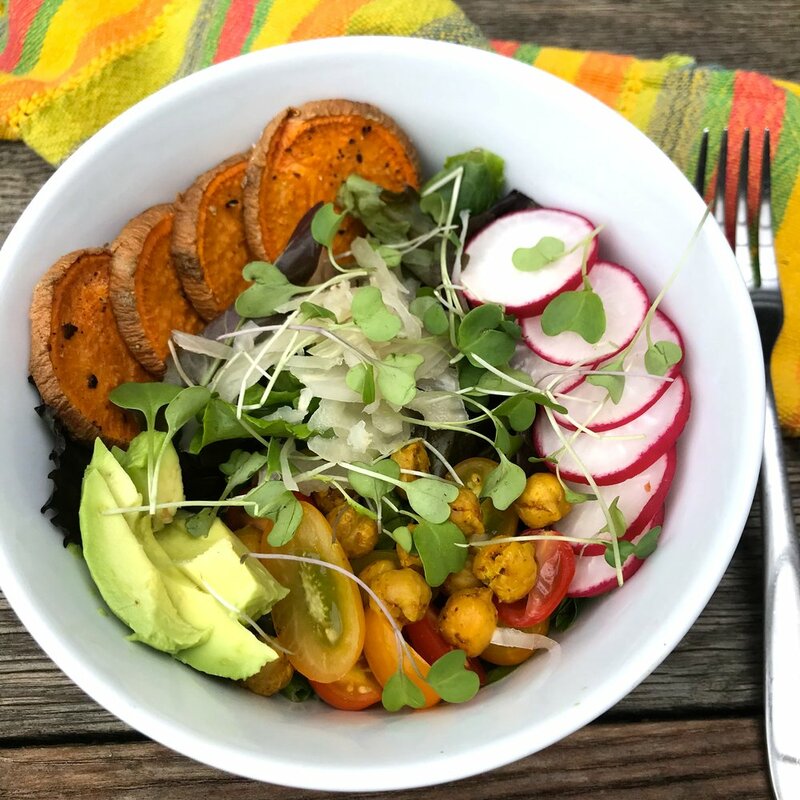 This beautiful and healthful bowl of food is from Palette food and juice. hard not to appreciate and slow down when eating a meal like this! Becoming more aware of how we're eating really can have profound effects on our health. Give these suggestions a try, and notice how you feel. It may not happen right away, but over time you'll train yourself to eat in a more relaxed, mindful state. You may notice you feel less discomfort after meals, have more energy, or even lose a few pounds. You may also be more aware of how the meal you've had makes you feel, a great tool for eating the foods that are right for your body. As always, I love hearing feedback from you, so leave a comment! If mindful eating seems impossible, contact me for more support.